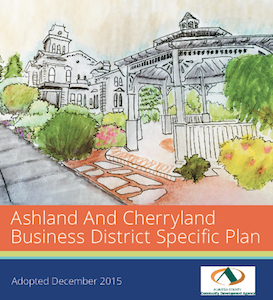 The American Planning Association (APA) recently awarded Alameda County the Northern Section Award for Excellence in Economic Planning and Development for the Ashland and Cherryland Business District Specific Plan and Code (ACBDSP). Adopted by the Alameda County Board of Supervisors in December 2015 by a unanimous vote, ACBDSP builds on and empowers the original Specific Plan by encouraging sustainable economic growth while outlining priorities for implementation. Seifel served on the multidisciplinary team (led by Lisa Wise Consulting) responsible for developing a community-driven vision and implementation plan for the Plan Area and updating the 1995 Specific Plan. The team's work emphasized economic revitalization through place-making, innovative implementation strategies, creative marketing, branding, public improvement programs, multimodal transportation plan, robust community outreach and form-based code. The consultant team of experts also included Opticos Design, Fehr & Peers, Rincon Consultants, Local Government Commission, Seifel Consulting, MJB Consulting and JWC Urban Design. A copy of the adopted plan and code document is available here. And be sure to check out NorCal APA's awards page, here.